Substance misuse rarely occurs in isolation but is symptomatic of wider problems in young people’s lives. Catch22 are specialists at providing targeted substance misuse services for young people and offer a truly holistic approach, putting the young person at the centre of the treatment to understand and address the factors driving behaviour and build their personal resilience. We deliver universal, targeted and specialist substance misuse services exclusively for young people up to 25-years-old. Our provision is age-appropriate, multi-disciplinary and relevant to the wider vulnerabilities facing children and young people. Through early intervention, education and delivery of specialist treatment, we enable young people to make informed choices and reduce the impact of substance misuse, both on the individual and wider community. We pride ourselves on our ability to engage with young people and support them in building their personal resilience. Our work is augmented through our wider expertise in education, sexual health, children in care, troubled families, child sexual exploitation and runaways, and gangs. We provide psychosocial, harm reduction and family interventions for children and young people and their families or carers. We are people-focused, building resilience within individuals and communities. Our work is supported by a clear governance framework, ensuring quality standards that underpin service delivery within the context of effective safeguarding and risk management. We specialise in providing age-appropriate substance misuse provision for young people, working exclusively with children and young people up to 25-years-old. We know that it takes time and persistence to build the trusting relationships that are crucial to this work, and we know that young people respond better when they are able to shape their treatment. Our services are people-focused, flexible and work in the heart of communities and within the local safeguarding context. We bring our services to young people at the times and places they are needed most, develop personalised care plans and offer a wide range of interventions – from art-based therapy to family interventions – so we can deliver a treatment package tailored to the young person’s needs. Our integrated delivery models are adapted for rural and urban areas, and have proven effective at working with communities that are traditionally hard to engage. Our substance misuse services are closely aligned to CAMHS provision, operating joint working practice to support individuals presenting with mental health needs. We invest in workforce development and clinical supervision to ensure that our teams operate within local safeguarding principles and support young people in the most appropriate and safe way. This enables us to support young people with mental health needs who do not meet clinical thresholds to be seen by specialists. Our services listen to young people and work flexibly to respond to new psychoactive substances (NPS) and changing local patterns of drug and alcohol use. Our assessment and care planning incorporates harm reduction and interventions relevant to NPS and local need. We bring support and specialist advice to health and social care professionals. Many of our services operate from multi-agency hubs, working closely with local agencies to offer a truly integrated approach. 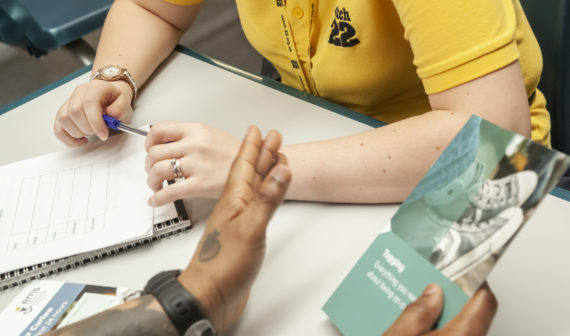 We also deliver information and training to the wider workforce to increase their capability and confidence to support young people with substance misuse issues. Our volunteers receive full training, support and supervision, including peer-to-peer support and mentoring, and make an important contribution to our high quality provision. Contact us if you have an enquiry about Catch22’s substance misuse services and a member of the team will get back to you as soon as possible. Talk to us about how we can work with you to deliver substance misuse services.